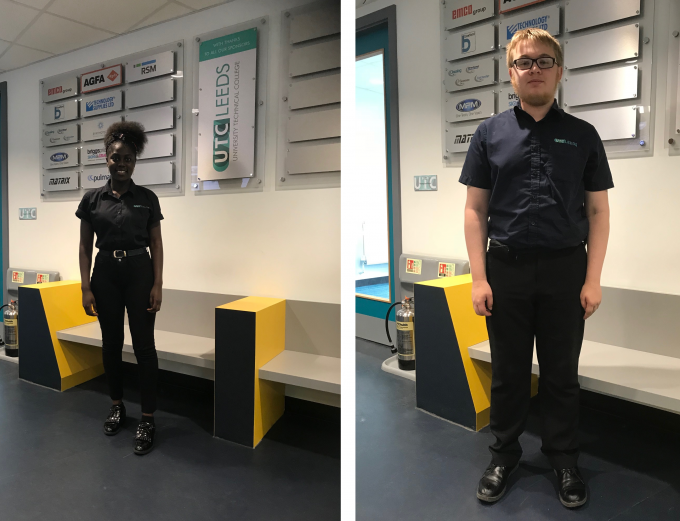 The UTC Leeds Key Stage 4 uniform policy is designed to support a purposeful and safe working atmosphere and to support students with preparing for the world of work. We expect students to follow the Key Stage 4 uniform policy at all times and we ask for full parental/carer co-operation in ensuring students are suitably dressed for college. Appearance should be of that expected in a work environment and therefore extreme styling is not acceptable. Smart leather belts with a plain buckle ONLY are permitted with skirts and trousers. UTC branded navy blue shirt with stiff collar, available from school supplier (as detailed below). Students must wear formal, black sensible leather shoes with black laces (not trainers or boots*). In the interests of Health and Safety the following cannot be worn; stiletto heels, shoes without backs or covered toes or pumps. If students attend college in incorrect uniform, they will be given the opportunity to borrow items of correct uniform, or will be placed in isolation until they have the correct uniform. Hair must be a natural colour. Therefore coloured hair e.g. red, purple, blue etc. is not allowed. No extreme styles are permitted. Long hair must be worn off the face and tied back in practical lessons for health and safety reasons. If students attend college with an extreme hair colour they will not be permitted to attend lessons and will be placed in isolation until the hair colour returns to a natural colour. Make up should be subtle and jewellery should be limited to one set of simple ear studs per ear. No facial piercings e.g. nose studs/rings are allowed for safety reasons. Bags should be a rucksack or messenger style bag, which is able to hold A4 size file items/stationery and can be fastened securely. Y10 and Y11 students must store their bag and outdoor clothing in their locker during the school day. Y12 and Y13 students must store their outdoor clothing in their locker during the school day. Outdoor clothing, including coats, hoodies and jumpers (except the UTC branded jumper for Y10/Y11) must not be worn in the school building. The following equipment is required within school every day by all students in years 10-13. It is essential that students are fully prepared for the learning experience and have the equipment to allow them to take a full part in all learning opportunities. We have divided the equipment list into items that are essential and those which are desirable. In addition ALL students will need a combination padlock for their locker. They will need to bring this on the first day and inform the reception team of the combination code during the induction process. Thank you for your support with the KS4 uniform policy for your son/daughter. Please contact Mr. Winterbottom (Director of Key Stage 4) at oliver.winterbottom@utcleeds.co.uk if you require any further information.